When we become moms our lives change so much. We understand the true meaning of unconditional love and give everything to see that smile on our angel’s face. What most moms do is focus on their babies a lot of time and tend to forget to take care of themselves. Whether it is a stay-at home mom or a working mom, generally mother’s tend to have less and less time to focus on themselves and are concerned about the baby, family, job, house and other things. 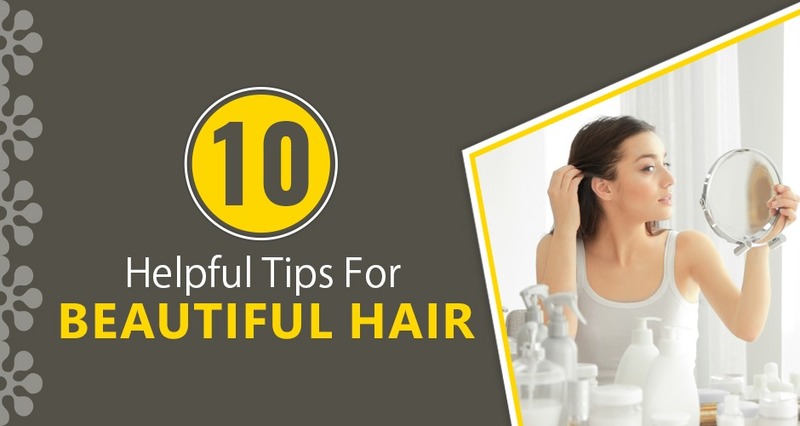 In this article, you will find easy haircare tips for busy moms. It becomes important to take care of yourself too and make time for your body and how you look. If you look and feel beautiful, you will definitely be more happy and content. That doesn’t mean spending your wallet on expensive salon treatments. Coconut oil is a natural hair conditioner. You can apply a little warm coconut oil at night and then shampoo it in the morning. You will have lovely, smooth and soft locks. Shampooing every day leaves your scalp dry and hair brittle. Have some time for hair to rest between washes if you are washing your hair every day or every alternate day. The natural oils that come out of your scalp do your hair good, so let them be a little oily naturally if you haven’t washed it for a day or two. Using a little baby powder to brush on your hair will take care of the grease. Sometimes you do not have the time to shampoo and blow drying your hair every time is also a huge task. Thus a little brushing or dusting of your hair with some baby powder will take care of the grease and you will have a nice scent too. Damn your hair before going to bed. You can do this on the sink and you do not have to shampoo it too. Braid your damp hair and go to sleep. In the morning when you wake up you will have nice, lovely curls that look like soft curls done by a roller. So you do not have the time to style your hair and are always tying it in a pony? No Worries- you can use various styles in a ponytail as well. You can try a low ponytail, pull back-high style ponytail, a medium one with locks in front. You can even use some hair spray on your ponytail to not make it seem frizzy and keep it in its place. We have tons of great hair accessories these days and can be a great way to make your hair look nice. Use a hair band, a headband, clips in various shapes and you will be good to go. You can play with different parts and have various partings and accessorize with clips. Pull your hair back with a colourful headband and it will be the back to school look for you. If you want straight hair and have no time to go for smoothening or straightening with an iron; then olive oil will come to your rescue. You can massage your hair with olive oil- overnight works best and then shampoo it in the morning. Comb your hair with a smooth brush while it is wet and when your hair dries naturally, you will have straight hair. This trick works on people who have wavy or frizzy hair but not curly hair. Did you know that bedhead is in these days? So sometimes it is nice to just give that messy look to the hair and embrace the natural texture of your hair. So give those hair tools a break and embrace your locks. Run your fingers on wet hair and let them dry naturally after a shampoo. Do you have really frizzy and unmanageable hair? USe your favourite body lotion- just 1 teaspoon of it or less depending on the length of your hair and apply it on the ends on your hair and over it, not on the scalp. This gives a smooth and soft texture in just a few minutes. It works beautifully and your hair smells great. As a busy mom you hardly have time to go to a salon thus you should invest in some good products that are not harmful and are suited for your hair type. A good shampoo and conditioner are all you need if you are planning on investing in a great hair product. You can also use some natural hair techniques like using curd for conditioner or an egg for softness. This can be done once in two weeks and gives you shiny and healthy hair. Also read: Is it Safe to Color My Hair During Pregnancy?